The pair forged a strong friendship when they met at Subiaco Oval two years ago after Kalin was diagnosed with the rare rhabdomyosarcoma at age 12. Bolton kept a photograph of Kalin in his locker as the Swans went on to win the AFL premiership that year. In an email to the Weekender, Bolton described the Prendiville Catholic College student as ‘such an inspiration to so many’. ‘Having had the opportunity to speak with him in his final stages on the phone, Kalin was still cheering on the Sydney Swans,’ he wrote. ‘It was heartwrenching just speaking to him, and his incredible parents Paul and Brigitte. ‘We all feel for his family and close friends in this terrible time. The retired 325-game star wrote a tribute on his Twitter feed, telling his 28,000 followers Kalin was his ‘inspirational little mate’. Swans chairman Andrew Pridham also posted to Twitter, saying the club was ‘devastated to hear of the passing of our brave friend Kalin Foley’. The Swans, who face Hawthorn in the AFL Grand Final on Saturday, paid tribute in a post on their webpage titled ‘Vale Kalin Foley’. 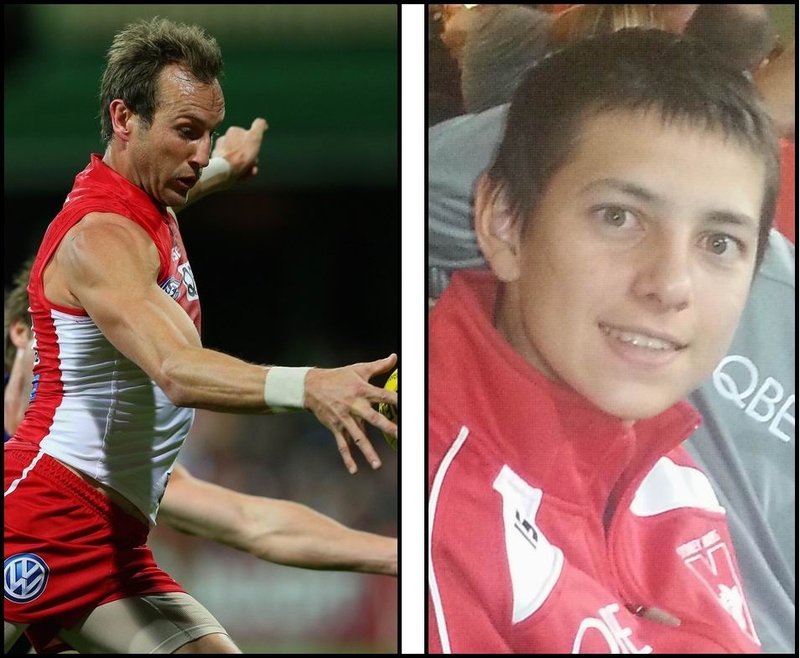 ‘The Sydney Swans shared numerous memories with Kalin and his family during his treatment, both in Perth and most recently at the Geelong game at the SCG earlier this year,’ it said. In each year since Kalin’s diagnosis, his local club Wanneroo and Ocean Ridge Junior Football Club, where many of his friends play, have held the annual Kalin Foley Cup in his honour. It began as a fundraiser for the Foley family in 2012, but has grown to raise thousands for the Sock it to Sarcoma cause. Kalin played the central role in each clash, leading the teams on to the ground at the beginning of play.